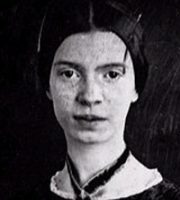 Emily Dickinson was an American poet. Although Dickinson was a prolific private poet, fewer than a dozen of her nearly eighteen hundred best poems were published during her lifetime. The work that was published during her lifetime was usually altered significantly by the publishers to fit the conventional poetic rules of the time. Dickinson's poems are unique for the era in which she wrote. Many of her poems deal with themes of love, death and immortality.